With our 11th update we wanted to talk about one of the features of the Masters Toolkit that we are currently implementing. Having constructed a map making tool with the Cartographer and an audio library through the Soundscape in the one Software, we can link the two together in some fun ways. As such we have started experimenting linking sound effects with objects in the Cartographer, giving doors creaking sounds as they are opened, sounds of a flame being lit or snuffed out. This is just going to be the first of many features that will focus on the interactivity of each section of the Masters Toolkit, as we continue to grow and expand the software, everything will be made to work seamlessly with one another to try and make the best Masters Toolkit we possibly can! 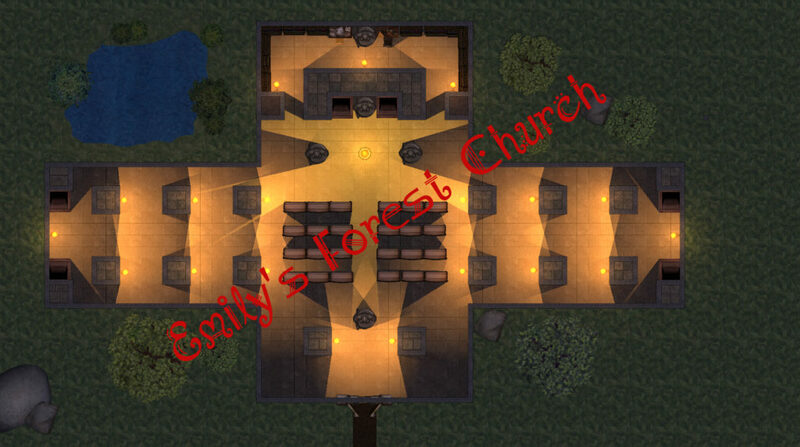 This week we have a map submission from Emily, feast your eyes on her Forest Church! Please continue to send us your maps!